Osborne One glitches, now what? I did some serious searching and found the service manual(which seems to be for the 1b, this is the 1a), and this post that mentioned a semi-similar issue. I guess what i was hoping was that there was someone on here who had experience with these, or remembered owning/working on one back when they were current tech. I figured if anyone who knew anything about these was hiding out but still active online, MeFi would be a good place to start. So yea, basically, any thoughts on this? I have a lot of experience working on modern desktops/laptops, soldering(including stuff like recapping amps and modern desktop motherboards), and building stuff like tube amp kits. 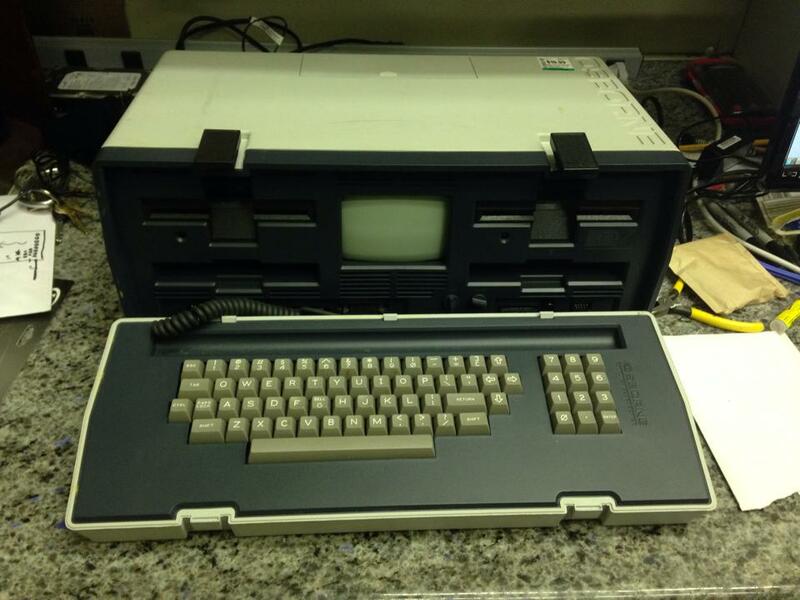 I also have the assistance of a really experienced technician who remembers this thing from right when it came out. He never worked on these, but is game to help me. I bought up all the inventory of these things when I was in Denver in the 1980s after Osborne went belly up and had a little business fixing them. Fixed and upgraded 100 of them. You won't believe this, but smoeone just posted a link on my fb page about 80s computers and i put a pix of an Osborne Executive ( http://en.wikipedia.org/wiki/Osborne_Executive ) on the response. OK, so that's more color than should be there. It's really all green, right? Second, these units had 52 column screens (and Zenith monitors). Your monitor is probably OK. It has raster and hi voltage, but it looks as if the unit has character gen/video issues. the major failure mode of the monitor was a 2sd313 power transistor cold solder joint and that I think was a vertical amplifier, so yours is OK. There was an upgrade kit from 52 to 80 columns that was a piggy back board that went inside the unit. it plugged into some IC sockets, and there were also several haywires soldered to a number of places on the motherboard. i put in many of them. could be a loose board. all depends on if you have that upgrade. hit the reset button. a second later, hit the enter/return button. the left hand drive light should come on. if it does, you have verified the processor kernel and the keyboard. hit reset again, but this time, hit TAB. the right side drive light should come on. further verification that the kernel is Ok.
did you get OS disks? I have some. Yes, Virginia, there is a Santa. The little block to the lower right of the CRT... it's for an external monitor. remove it and reseat it. Just in case. You need to have it in there for the video to work. do this and report back! what fun! any chance you have better pix? You are in even better shape than I thought. The manual has the 80column screen pack upgrade instructions AND schematics as well as the schematics for both the O1 and the O1A AND the Executive. You have a road map and that's 95% of the problem. Cool. This board with an old 9 pin serial type of flex cable running to it is attached, via some glued down plastic brackets to the mobo. Is that the upgrade board you mean? It appears to interface with the mobo only with an IDE-socket type plug like the one it has on top of itself. When it boots up the drives spin continuously making a rhytmic seeking noise non stop, both of them. Hitting reset changed the pattern of the noise and clears the pattern on the display. It originally had some random garbage letters in it, but that cleared it to just being zeroes or square hex blocks. I don't have any OS disks or anything. All it came with was the keyboard and the entombed system. One of the first things i tried was reseating that video jumper block. Nah, that's the double density drive board. Original Osbornes came with 92K single-sided floppies. That board doubles the density to 180K and if you replace the single sided drives with two head drives, you get 360K. that's not your problem. you've got motherboard video issues and it'll need a scope and some probing. one of the things about the osborne was the video system and timing. i have forgotten who the original designer was, but his work doing this board was widely praised. that was a $2,000 machine back in its day. cheaply implementing everything on that board meant a lot of stuff had to be innovative. the symptom you have is one i have never seen, incidentally. no easy answers other than scope and hope on this one. it doesn't sound like the processor kernel is good. my first task would be inspecting address and data lines on the z80 micro that runs it. could be RAM failure, too. i recently worked on some old RCA video games from even earlier and found many LSI chips dead from static. older parts aren't that robust compared to today's stuff. CMOS is particularly bad. Best tools to troubleshoot this thing is another working O1 and a Fluke 9010 Micro System Troubleshooter with an appropriate processor pod. I have pods for the 1802 micro and the 8051/52 micro, and a 9010, but don't have one for a Z80. They are available. About $300, more or less. If you can find someone locally who repairs arcade games, sometimes they will have them. These machines make it possible to examine memory maps, check EPROM contents, verify bus conditions, etc. Handy. Fluke 9010 is about a $400 item, too. Just for completeness, I am always a broken record on this..... 90% of the problems I have ever encountered in electronics are connectors. Most of the rest are power related. Only about 1%-3% are parts failures and the rest, design issues. I work on a lot of really complicated, old stuff, too. In 40 years, these numbers have been fairly constant. Shoot me a memail and we'll talk off line about this. If it's all the same to you guys, as someone with absolutely nothing to contribute to solving the problem at hand, I would like to request that this exchange continue in a place where I can read it. Nothing sticks out to me as a particularly promising avenue, but the fact that the data on the CRT repeats suggests to me that the video logic is probably good. The NMI of the Z80 is used to get CPU attention for display refresh, IIRC, and video RAM is mapped in general RAM. The display is stable, and full, meaning that the sync circuits and other timing logic is probably OK. The full display raster suggests that the power supply is OK. So the timing of the video looks good, but the micro isn't doing anything. 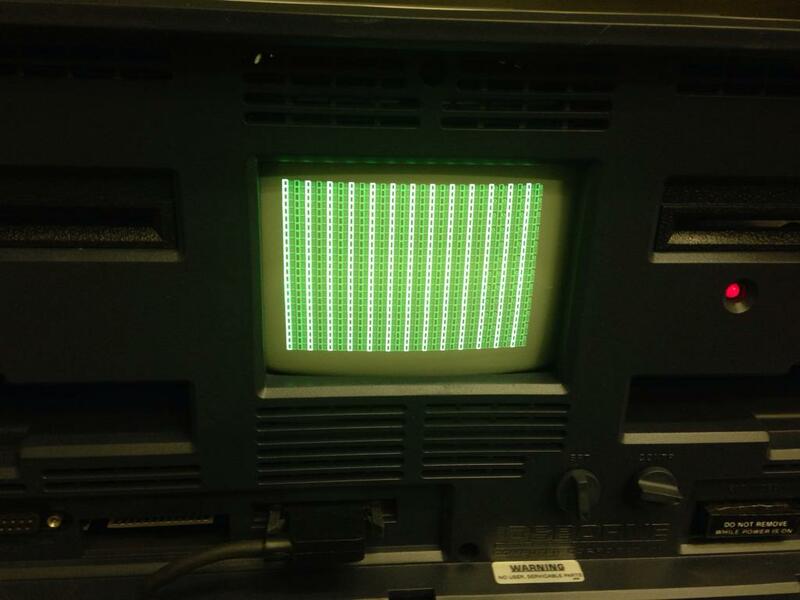 If it were, the repeat patterns on the CRT would be scrambled, not static. The uninitiated would call what you are seeing a video problem, but I see mostly good video. What I see from your description of behavior is processor kernel issues. The fact that the reset button results in different behavior from push to push bolsters my guess that the processor kernel isn't working at all. The single most likely culprit is the micro, which is socketed. Even though it's a Z80, seems to me it was an NEC version and had a different nomenclature, but it's one of two 40-pin socketed ICs on the board, and the other is a floppy controller, UC15, easy to find and the end of that little ribbon cable from the double density board. Processor is UC11. Pop that sucker out and reseat it. The floppies, the reset, the video... none are working and the processor is common to all their processes. Gotta get that sucker working first. 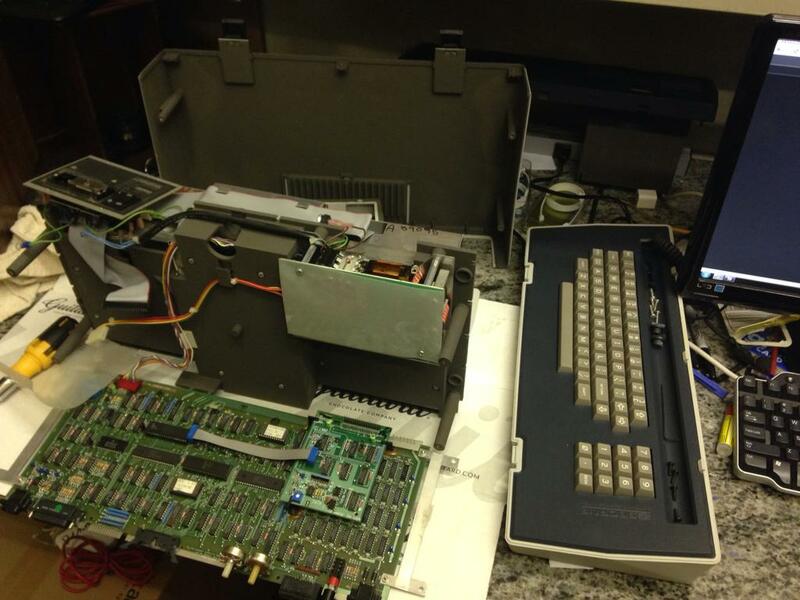 If you can find a legacy machine of any sort with a z80, having a known-good part is the first place to start. The reason I like the Fluke is that it substitutes that chip, and it forces the pins to do what it wants, allowing you to access, inspect, control the IO on the boundary of the chip and verify it all. Fastest way possible to troubleshoot one of these things. here's a pod on ebay. Here's a z80. There are a bunch under 'z80 chips' if you want to search. The general technique for processor kernel debug is to get it to do something repeatable. Since you don't have a Fluke (but I do), there are some tricks if you have some UVEPROMs and a chip programmer. With a known-good processor, you put in a small machine language program to exercise the data and address lines and use a scope to see that they are all wiggling. Before you get that far into this, just scoping out the processor pins to see that you have a clock signal and that the various data and address lines are moving between 0 and 5 volts will boslter your confidence in the micro. I'm stopping now, since this could turn into an encyclopedia for how to get a $50 computer working again by spending 100 hours and $10,000 on it, but if you have any interest in getting it flying, holler and we'll talk. Something i think is important that i forgot to note in the previous posts, the speaker beeps continuously when its powered on. Not a cyclic beep, just a non-stop BEEEEEEEEEEEEEEEEEEEEEEEEEEEEEEEEEEEEEEEEEE. I'll also note that intermittently, there ARE legible characters on the display mixed in with the simple  pattern garbage. Not every time its powered on or reset, but sometimes. Tomorrow i'll have a lot of time to kill on this thing, and my coworker is bringing in his logic analyzer and a lot of other electronics tools, As it is someone stole the fluke multimeter from my shop(ugh) so i couldn't even slap it on the CPU pins and see what was going on. 90% of the problems I have ever encountered in electronics are connectors. Most of the rest are power related. Only about 1%-3% are parts failures and the rest, design issues. I work on a lot of really complicated, old stuff, too. In 40 years, these numbers have been fairly constant. I have had similar experiences. From SATA cables being faulty in brand new workstations, to cold solder joints or slightly corroded molex-type connectors in old harmon/kardon separates or my old car. I think before i proceed any further i'm going to remove and reseat EVERY socketed item on the motherboard. My point though, is see how it's discolored compared to the other chips and the label is faded and flaked off looking? could that be from heat? am i barking up the wrong tree here entirely? 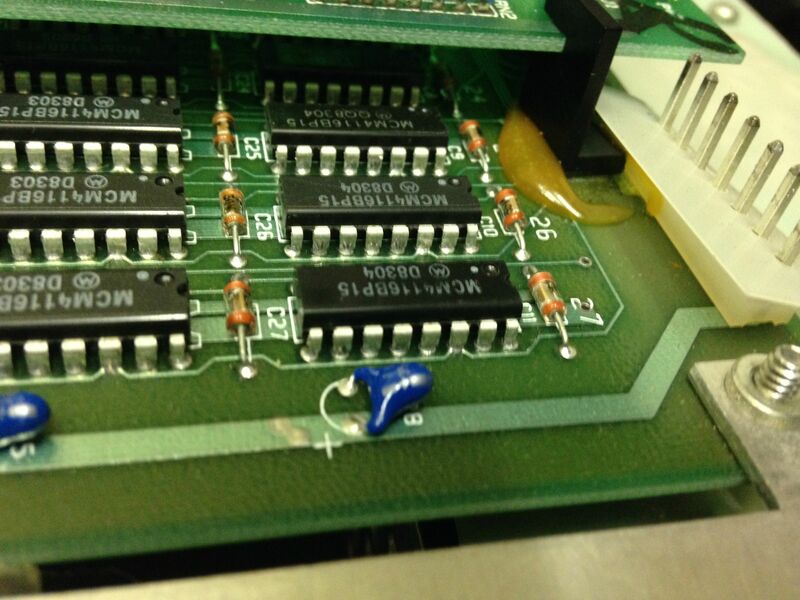 none of the other chips on the board are at all shiny/discolored like that or have flaking off labels. one is slightly glossy like that, but not nearly as much. Yup, that's RAM, all right. 4116 DRAM. The pix doesn't show it as being to discolored to me, at least. It COULD be, though. You are in a better position to tell. If you are desparate and can't find a part... remove one elsewhere carefully enough to socket and remove the suspect one and socket it. Switch them and see if the symptom changes. RAM is essential to the stack. If that's in the right place, it could prevent OS boot. Worth a try. Keep me posted and I am happy to help in any way. Cmos of that era sometimes encountered "latch up", a condition that resulted in the substrate of the chip acting like an SCR ( silicon controlled rectifier ). Always fatal to the chip, and if a RAM chip, fatal in a bad place. You could be right. 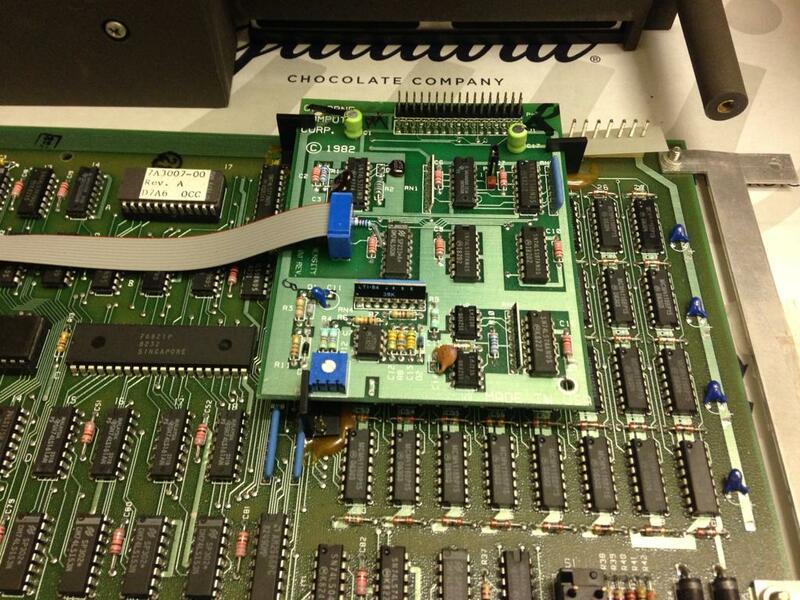 If your friend had a z80 pod for his logic analyzer, i bet there is no activity at the micro. I'd get A scope first. Check power supply voltages on the z80, the reset line, clock lines. If reset is good, and you have clock, look at all the data lines for activity, then look at the address lines. By then, you will have a good idea as to processor health. Absent a Fluke, i can send you some code for simple processor ops and you can burn an eprom to run it. Step 1 is getting the processor to reliably do something. I will be around all weekend, so don't be bashful. For anyone who is interested, osbornes were popular with early adopters. In Denver, lawyers, docs and engineers owned them.. Later machines, like Kaypros, were second adopters, mostly writers, students, home workers. Adam Osborne was making a ton of money. One day, he said "next year, we are coming out with a PC compatible Osborne!" And that day, his sales dropped to zero when everyone decided to wait. Within 60 days, Osborne Computer Corporation was bankrupt. Good for me, of course, but a real study in how risky it is to open your mouth in techie land.